As low-cost computing becomes increasingly accessible, larger and more complex simulations are becoming commonplace. TLG has developed technology to utilize excess computing capacity on the world’s largest provider of computing resources, Amazon Web Services (AWS). This enables us to conduct simulations at nearly any scale, securely, and at a fraction of the cost to maintain on-premise hardware. TLG passes these savings on to its customers. TLG utilizes this High Performance Computing (HPC) capability to support client projects and can assist with the creation of similar capabilities for other organizations seeking to replace on-premise systems or increase capacity. TLG was proudly featured by Amazon as the first Case Study for the successful use of AWS for low-cost High Performance Computing. Streamlined Process: TLG has streamlined the process to manage the project lifecycle for computational analysis performed on AWS. While TLG utilizes AWS primarily for CFD analysis, our processes can be adapted to most applications. These include serial applications, memory or I/O-intensive applications, and massively parallel applications requiring a shared file system and Message Passing Interface (MPI). End User Control: End-users would have the ability to select the location, type and number of compute nodes to use and an automated process would be employed to initiate and terminate resources, manage data transfer and archives, enable real-time monitoring, and push results back to your on-premise network. Security: Security is maintained via a Multi Factor Authentication system to ensure that only authorized users have access to off-premise data. Likewise, data are protected from un-authorized export under ITAR via encryption which prevents non-authenticated persons from accessing data. In most cases, resources are accessible as though they are on-premise and so minimal training is required for end users. Critical Data Availability: The data lifecycle is managed to ensure that critical data are available on-premise as soon as it is available. Other data remain on the cloud until such time as it is requested by the end-user for download. 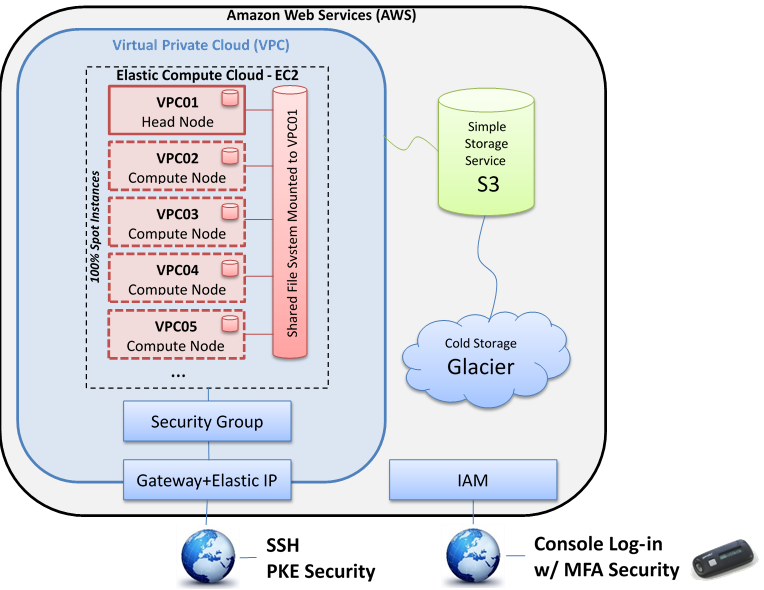 Archives can be made for on-premise storage or off-site using Amazon’s Glacier cold storage service. TLG provides managed HPC services for AWS customers. Managed services involve a fixed-price or time-and-materials contract to support and maintain a functioning AWS installation. Services include technical-support, user account management, process development, data lifecycle management, reporting, and periodic audits of end-user practices. For more information about managed HPC services, please contact us.